Nobody knows for sure, but they say that some 700 to 800 people annually try to thru-hike the Pacific Crest Trail (PCT), a ribbon of trail that starts at the Mexican border outside of San Diego and winds its way for 2,660 miles all the way to Canada. Only about 300 to 400 complete the hike every year. Carrot Quinn has done it both in 2013 and 2014. She started in late April and reached Canada five months later in late September. 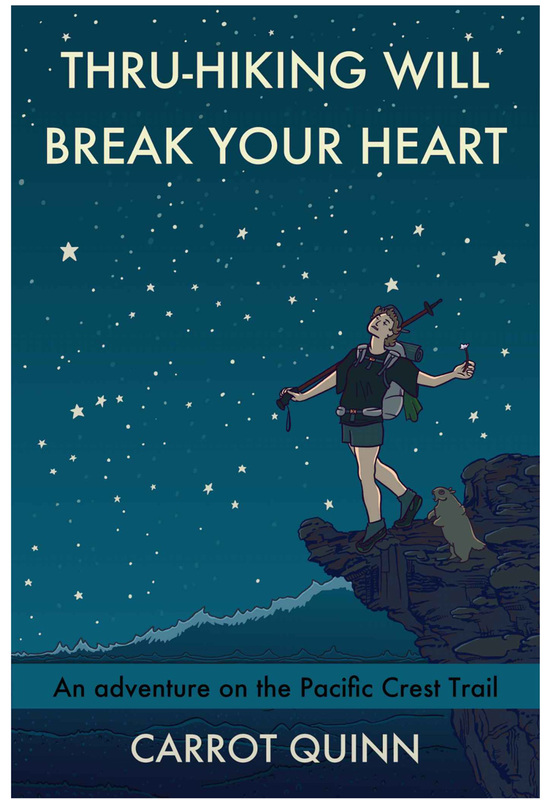 Thru-Hiking Will Break Your Heart is her memoir of her 2013 hike, her first serious hiking endeavor. She celebrated her 31st birthday in September on the trail, in what she describes one of the most miserable days and nights of her life. Unlike Cheryl Strayed’s famous story in book and movie – Wild – Carrot’s account is not about overcoming any demons of her life. It’s all and only about the hike. The book is written in the first person and in the present tense, which makes it read like a journal, and it really is a journal, pouring out the raw emotions of exhilaration, pain, terror, dread, joy, lust and accomplishment. You might wonder how she was able to fill this novel-length book with stories about the trail and the hike, without getting sidetracked into back-stories. But she does it. It’s a memoir I could not put down and worked through quickly. Granted, I am interested in hiking, and the PCT has always been a lure. I am pretty sure that anyone not interested in and passionate about hiking would not find the book as readable as I did. To them it would be overkill and repetitious. But for those of us that love hiking and want to know what it’s like to do an epic hike like the PCT, this is the story that will bring it all to life. I felt like I was right there with Carrot and her friends, and I caught a glimpse of what it must be like to be out there on that monstrous journey, that endless trail that is the PCT.